Unfortunately, the Dallas Cowboys don't report to training camp for nearly another month. That means there isn't much going on football wise, so all we can really do is speculate about certain topics right now. One such topic that hasn't really been discussed much is the how Cowboys' linebackers have the potential to be something special in 2017. The Dallas Cowboys biggest area of weakness over the past several seasons has been their defense. That is why the main focus this off-season was finding the right players to improve the roster and depth on the defensive side of the ball. Defense. Defense. Defense. This is the main area of focus Cowboys' fans will be paying attention to the most once the pads come on in training camp. Nearly every position on defense will be overhauled and will likely see at least one new face starting in 2017. And yes, that includes the Cowboys' linebackers as well. Even though the Dallas Cowboys didn't really add anything new to the linebacker position this off-season, I think this unit could possibly be the best on the entire defense and turn into something special if things turn out right. This might just be the most talented group of linebackers the Cowboys have had in quite some time. The majority of the talk surrounding the Cowboys' linebackers has centered around second-year player, Jaylon Smith, and his still progressing recovery from his devastating knee injury. All Cowboys' fans are hoping Smith can return to his collegiate form, but unfortunately the jury is still out until he can prove he can stand up to contact when the pads come on in training camp. Word is Smith has looked really good in noncontact drills throughout organized team activities (OTA's) and minicamp practices. This is certainly really good news for the second year LB, because the Cowboys' defense could certainly use his playmaking ability. But, Smith's return to the field is only partially why I believe the Cowboys' linebackers could be special in 2017. The old man of the group, Sean Lee, has stated that this is probably the healthiest he has felt in his entire NFL career. To think that Lee could be even better than what we have seen from him in his career is scary. He is already one of the best LBs in the league and having him at 100% makes the defense better. Sean Lee is without a doubt the Cowboys best defender. Keeping him on the field is in the best interest of the entire defense, because they simply aren't the same unit without him. He is the heart and soul on the defensive side of the ball. But, Sean Lee and Jaylon Smith aren't the only Cowboys' linebackers who look to have improved since last season. 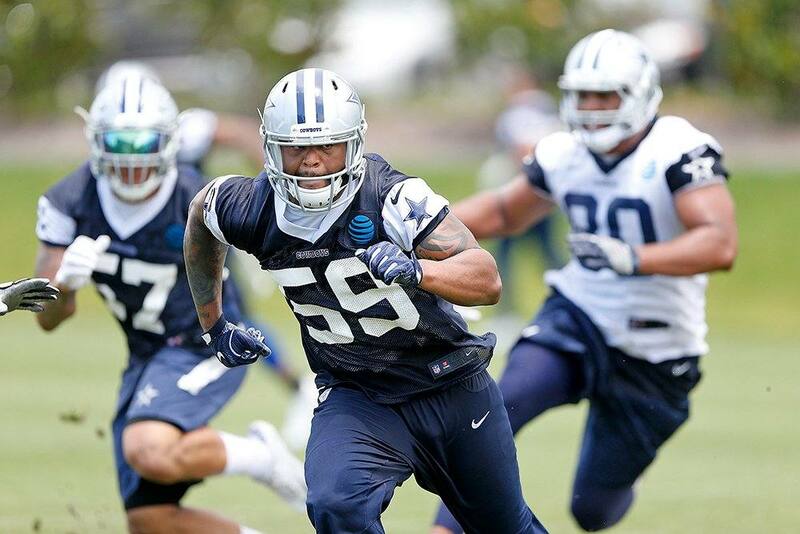 Anthony Hitchens and Damien Wilson have also been reportedly playing really well in these off-season practices so far. Anthony Hitchens was thrust into the starting lineup after troubled linebacker Rolando McClain decided to call it quits. Hitchens has been a solid contributor for the Cowboys' defense since his rookie year and did a good job last season as a starter. Hitchens has supposedly been flying around in practices and has looked like a man possessed. He has heard all the talk about Jaylon Smith coming in and taking his starting position, but it doesn't look as if he's going to give it up without a fight. Then, you have Damien Wilson. Wilson's 2016 season didn't get off to a very good start due to an unfortunate eye injury because of a paintball accident. That injury caused him to miss time and much-needed practice, which hindered his development. He ended up finishing last season strong and looks to build upon that success in 2017. Sean Lee, Anthony Hitchens, Damien Wilson, and Jaylon Smith are all athletically gifted linebackers. These four really give Rod Marinelli options about how he wants to deploy his LBs, because they are all crosstrained to play each LB position. I'm going to go out on a limb here and say that if the Cowboys' linebackers are able to stay healthy in 2017, they end up being one of the best LB units in the entire NFL. That in turn should help improve the overall play of the entire defense, which should be encouraging considering to all Cowboys' fans. I know this is a bold statement to make and is all based on speculation at this point. But, I truly believe the Dallas Cowboys' linebackers have the potential to be something special this season. Now, all they have to do is get on the field and prove me right. Do you think the Cowboys' linebackers will be special in 2017?